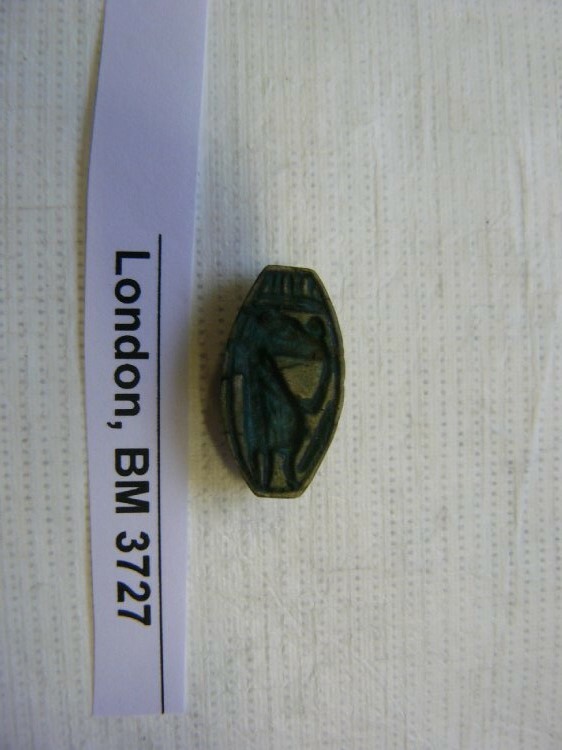 One of the highlights of this season’s excavation within the town area at Sai was the discovery of a beautiful cowroid bead (SAV1W 723) containing an image of the Egyptian goddess Taweret. The object was uncovered in SAV1 West within the first few weeks of the excavation (17 Jan). It measures 17x9x5 mm, is made of a glazed composite material, and is longitudinally pierced to enable suspension. While the object was found in a mixed area, it is likely that it dates to the New Kingdom—and specifically to the Eighteenth Dynasty—based on examples known from elsewhere (e.g. BM EA 3737). The cowroid is a popular form of scaraboid with a circular or elongated oval base with markings on its back, which show that it was based on the cowrie shell. 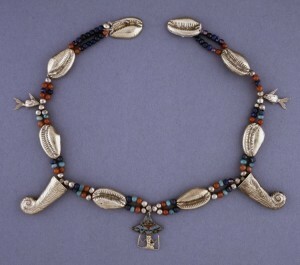 The cowrie shell was believed to have amuletic significance because of the resemblance to the female genitalia. These shells are even found in graves dating to as early as the Predynastic Period. However, from the late Old Kingdom onwards they were being imitated in blue-glazed composition and other semi-precious stones, with gold and silver examples known from the Middle Kingdom (e.g. BM EA 3077). Usually part of a woman’s girdle, the cowroids would have been in exactly the right place to ward off evil influences from the relevant bodily part of the wearer, especially if she were pregnant. Taweret, whose name means “the great one”, was one of the most popular female deities throughout the Dynastic Period. She is mainly depicted in composite form: the head of a hippopotamus, the legs and arms of a lion, and the tail of a crocodile. Perhaps the most well-known representation of her is the stunning schist statue, dating to the Saite Period, which is now in the Cairo Museum (CG 39194). Taweret is often shown next to a s3-sign, the symbol of “protection”, as can be seen with the cowroid in question. Despite her ferocious appearance, Taweret was invoked as protector of pregnant women and childbirth. In fact, Taweret is depicted with pendulous breasts and a large belly, thus imitating the appearance of a pregnant woman. On the cowroid from Sai Taweret can be seen wielding a knife, an iconography commonly attested on Middle Kingdom apotropaic wands, such as the one discussed here (Met 30.8.218). 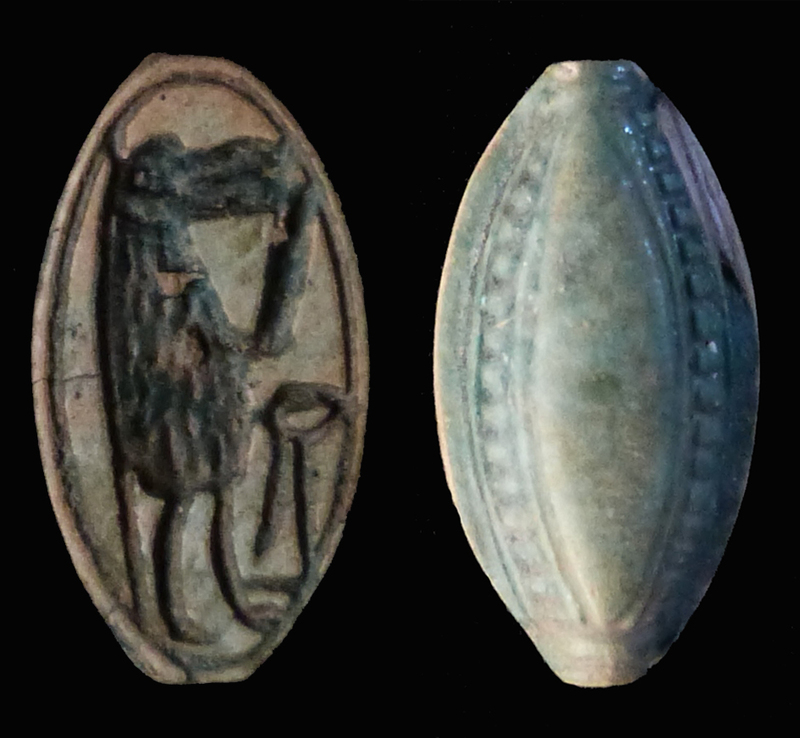 The mixed symbolism of a cowrie shell and the representation of Taweret would seem the prefect remedy to protect a pregnant woman during this vulnerable period. The fact that the cowroid is pierced longitudinally would suggest that it was worn across the pelvic region as part of a girdle. While it will never be known if the cowroid had the desired effect, or if it was worn by an Egyptian or Nubian inhabitant, objects such as this provide us with a small glimpse into the private and religious lives of the ancient population on Sai. 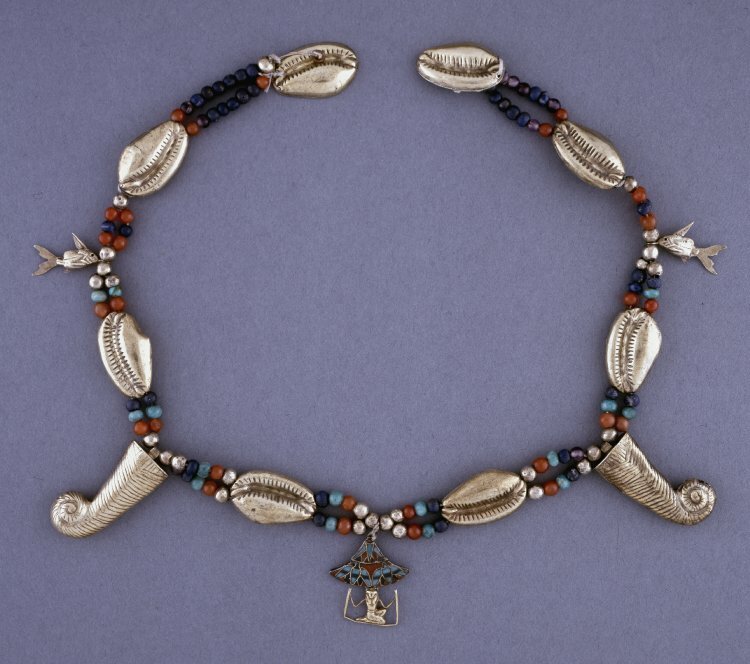 This entry was posted in 18th Dynasty, Archaeology, Fieldwork, Material Culture, New Kingdom, Sai Island, Upper Nubia and tagged amulet, cowroid, Taweret by Kenneth Griffin Meg Gundlach. Bookmark the permalink.